What it takes to be strong? And what it takes to be fit and fab? Sometimes you need to challenge yourself and get motivated. 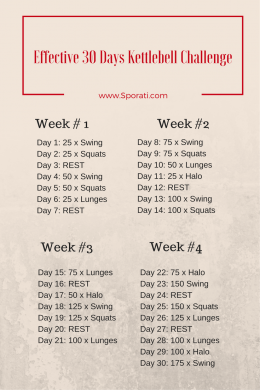 Here is an effective 30 Days Challenge, enough to have your daily workout done and gain strength. 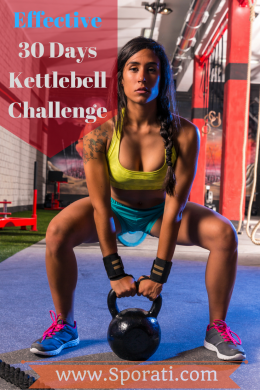 Kettlebell is one of so many workout equipment’s that can be used to perform ballistic exercises that combine cardiovascular, strength and flexibility training. There are different weights for kettlebells, so choose what you can carry and is best for you. Swing – it works from standing position to knee bending while swinging the kettlebell forward with your arms stretch. Squats – from a squat position you can either swing the kettlebell forward ; or carry/grip it with both hands up and down. Lunges – from a standing position then forward lunge while doing push-press with the kettlebell. Do this switching left and right leg. Also you can do side lunges if preferred. Halo – begin with standing position hip apart, holding the kettlebell and lift it around your head back to chest level. These exercises works the muscles on the hips, gluts, shoulders, abs and also your grips. Challenge yourself, gain strength and endurance.